Background: Simple decompression and anterior transposition of the ulnar nerve are surgical methods commonly used for treating moderate and severe cubital tunnel syndrome. It is generally thought that anterior transposition effectively eliminates ulnar nerve compression, but simple decompression cannot improve symptoms. However, studies have also shown that the therapeutic effects of the two procedures are identical. The advantages and disadvantages of the two surgical methods have been described in a small number of cases. Thus, we will conduct a parallel-group randomized controlled clinical trial to determine the optimal surgical intervention. Methods/Design: The trial will be conducted at the Center for Hand and Foot Surgery and Reparative and Reconstructive Surgery, Orthopedics Hospital, the Second Hospital, Jilin University, China. Moderate and severe cubital tunnel syndrome patients will be equally and randomly divided into simple decompression, anterior intramuscular transposition, and anterior subcutaneous transposition groups. In the simple decompression group, adhesions will be completely removed around the ulnar nerve. In the anterior intramuscular transposition group, the ulnar nerve and its accompanying nutrient vessels will be removed in the tunnel of the forearm flexor, pronator teres muscle membrane, and a small portion of muscle fibers below it. In the anterior subcutaneous transposition group, the ulnar nerve in the cubital tunnel will be dissociated and placed in the subcutaneous tissue of the forearm flexor and pronator teres. Two primary outcomes will be determined, sensory disturbance, tested with Semmes-Weinstein filaments, and muscle strength, evaluated using the Medical Research Council's grading system. The secondary outcomes of pain will be assessed with the Visual Analogue Scale and the function of the ulnar nerve with electromyography. Discussion: Trial results will provide a reference for selecting an effective surgical method for treating moderate and severe cubital tunnel syndrome. Trial registration: ClinicalTrial.gov identifier: NCT01893164; registered on 2 July 2013. Ethical approval: Written approval for this project was obtained from the Ethics Committee of the Orthopedics Hospital, the Second Hospital, Jilin University of China. Our study is in accordance with the guidelines of the Declaration of Helsinki, formulated by the World Medical Association. Cubital tunnel syndrome is an entrapment syndrome caused by increased tension in the tunnel the ulnar nerve passes through in the elbow. The incidence of cubital tunnel syndrome among upper extremity nerve entrapment in adults is second only to carpal tunnel syndrome (Kroonen, 2012). Patients with mild cubital tunnel syndrome can obtain satisfactory results after splint fixation or plaster slab fixation. Moderate and severe cubital tunnel syndromes always involve the intrinsic muscles of the hand, and once damaged, these muscles are difficult to rebuild and restore. Thus, surgical intervention should be conducted as early as possible to remove the entrapment in patients with moderate and severe cubital tunnel syndrome (Gu, 2010). However, no standardized treatment exists for cubital tunnel syndrome; the surgical method selected is mainly determined by physician's experience, patient's age, causes, duration, symptoms, clinical classification, motor nerve conduction velocity, and anatomic structure of the elbow (Lund and Amadio, 2006; Yamamoto et al., 2006). Simple decompression and anterior transposition of the ulnar nerve are commonly used for treating cubital tunnel syndrome (Davies et al., 1991; Bimmler and Meyer, 1996; Huang et al., 2004; Taha et al., 2004; Bartels et al., 2005; Gervasio et al., 2005; Nabhan et al., 2005; Biggs and Curtis, 2006; Catalano and Barron, 2007; Mitsionis et al., 2010; Stadie et al., 2010). Simple decompression does not change the original shape of the elbow. Liao et al. (1997) suggested that the short-term effect of simple decompression is good, but Ochi et al. (2013) believed that the long-term effect of simple decompression is uncertain. Anterior intramuscular transposition of the ulnar nerve can resolve the pulling of the ulnar nerve during elbow flexion. After anterior intramuscular transposition, the path is shortened. The ulnar nerve distribution is relaxed, and the nerve has good movement and cannot easily become entrapped. Anterior subcutaneous transposition of the ulnar nerve can lessen the compression of elbow flexion on the cubital tunnel and ulnar nerve and is suitable for patients with healthy subcutaneous tissue. It is generally thought that anterior transposition can effectively eliminate ulnar nerve compression, but simple decompression cannot achieve satisfactory effects in the treatment of cubital tunnel syndrome (Janjua et al., 2008; Capo et al., 2011; Hamidreza et al., 2011). However, numerous studies have confirmed that outcomes for cubital tunnel syndrome following these two surgical interventions show no obvious difference (Glowacki and Weiss, 1997; Fernandez et al., 1998; Gervasio et al., 2005; Zlowodzki et al., 2007; Mitsionis et al., 2010). Fernandez et al. (1998) found that anterior intramuscular transposition of the ulnar nerve greatly interferes with local tissues, and easily leads to elbow contracture. Glowacki and Weiss (1997) suggested that anterior intramuscular transposition of the ulnar nerve generally obtains good outcomes, but recovery is poor in some patients. Thus, the conclusions are inconsistent regarding the outcomes of these two treatment options (Macadam et al., 2008; Liu et al., 2015). Gu (2011) proposed a clinical classification-related treatment plan [Table 1]. The goal of the current parallel-group randomized controlled trial is to provide quantitative data for objectively selecting an effective surgical method for treating moderate and severe cubital tunnel syndrome. This parallel-group randomized controlled trial will be conducted at the Center for Hand and Foot Surgery and Reparative and Reconstructive Surgery, Orthopedics Hospital, the Second Hospital, Jilin University of China. We have obtained written approval from the Ethics Committee of the Orthopedics Hospital, the Second Hospital, Jilin University of China. The study will be conducted in accordance with the guidelines of the Declaration of Helsinki, formulated by the World Medical Association. An investigator or investigator-authorized physician will explain the aim, procedures, and risks of the study to potential participants and obtain written informed consent prior to the experiment. If informed consent cannot be obtained prior to the experiment in certain circumstances, it will be obtained as soon as possible; the date of the supplement and the related explanation will be recorded. The revision of any date or signature will be explained. All participants or their representatives and the persons who obtained the informed consent will sign informed consent forms. The original copy of the informed consent will be stored by the investigator. Patients with moderate or severe cubital tunnel syndrome hospitalized at the Center for Hand and Foot Surgery and Reparative and Reconstructive Surgery, Orthopedics Hospital, the Second Hospital, Jilin University of China will be recruited to participate in the study. Choosing to participate in a study is an important personal decision. Potential participants will be counseled to discuss the issues with their physicians and family members or friends before deciding to join the study. To learn more about this study, potential participants or their physicians will be instructed to contact the study research staff. Patients with moderate and severe cubital tunnel syndrome will be equally and randomly divided into three groups: simple decompression, anterior intramuscular transposition, or anterior subcutaneous transposition. All participants will be assigned a number by a statistician who has no direct contact with the participants. Each number will have a corresponding emergency envelope. The treatment program for each participant will be generated using a random allocation sequence and placed in a sealed opaque envelope. When qualified persons agree to participate, the envelopes will be opened and participants will receive appropriate treatment measures. Patients and implementers will be not blinded to patient group assignments and interventions. Outcome assessors and statisticians will be blinded to patient group assignments to avoid measurement bias. The blinded codes will be preserved by the study leader. For participants who experience severe adverse reactions, the emergency envelope will be opened. The reasons for opening the emergency envelope and the date will be recorded on the case observation form. All patients will undergo surgery after the application of a pneumatic tourniquet on the affected extremity under brachial plexus anesthesia or general anesthesia. Simple decompression: An incision (8 cm) will be made, taking the medial epicondyle of the humerus as a midpoint and extending toward the proximal and distal ends. The skin and subcutaneous tissue will be incised, without touching the terminal branch of the medial antebrachial cutaneous nerve. The medial intermuscular septum will be exposed, and the cubital tunnel will be opened. Adhesions around the ulnar nerve will be completely removed. The operative incisions will be sutured (Murata et al., 2014). Anterior intramuscular transposition of the ulnar nerve: A curved incision approximately 10 cm in length will be made along the groove for the ulnar nerve on the medial epicondyle. The skin, subcutaneous tissue, and deep fascia will be incised to expose the cubital tunnel. The ulnar nerve will be carefully dissociated. The accompanying nutrient vessels of the ulnar nerve will be reserved. A longitudinal incision will be made on the aponeurosis at the origin of the forearm flexor and pronator teres, and removed freely into muscle approximately 4 cm. The forearm flexor, pronator teres muscle membrane, and a small portion of the muscle fibers below it will be cut. This part of the muscle and muscle fiber will be able to move approximately 1 cm relative to the intramuscular tunnel. The ulnar nerve and its accompanying nutrient vessels will be removed from this tunnel. After suturing the muscle and affirming the moderate volume of the new cubital tunnel, the operative incision will be closed (Henry, 2006). Anterior subcutaneous transposition of the ulnar nerve: An incision approximately 10 cm in length will be made, taking the medial epicondyle of the humerus as a midpoint and extending toward the proximal and distal ends. The skin and subcutaneous tissue will be incised, without touching the terminal branch of the medial antebrachial cutaneous nerve. The medial intermuscular septum will be exposed. The ulnar nerve from the cubital tunnel will be dissociated and placed in the subcutaneous tissue of the forearm flexor and pronator teres. Simultaneously, the fascia will be sutured loosely to prevent the backward slipping of the ulnar nerve (Li et al., 2008). A flow chart describing the clinical trial is shown in [Figure 1]. Figure 1: Flow chart for the clinical trial. The primary outcomes will be assessed at baseline and 6 months after treatment. Muscle strength: The strength of the first dorsal interosseous muscle and abductor digiti minimi will be evaluated using the grading system of the Medical Research Council (Paternostro-Sluga et al., 2008). The secondary outcomes will be assessed at 6 months after treatment. Incidence of pain: pain will be assessed with the Visual Analogue Scale (Aicher et al., 2012). Incidence of hypoesthesia around the incision: sensory disturbance will be tested using Semmes-Weinstein monofilaments (Lim et al., 2014). Incidence of hematoma around the incision: hematoma will be evaluated using a previously described method (Kilpadi and Cunningham, 2011) The schedule for the outcome assessments is shown in [Table 2]. All patients will be followed up at 6 months after surgery at the outpatient clinic. Each indicator will be assessed by a physician blinded to the group assignment. If a participant is lost to follow-up, the person designated as a telephone contact will be selected to provide the reason for the loss of the participant. All data will be collected by an inspector and processed by a statistician. The data will be analyzed using SPSS 21.0 software (IBM Corp., Armonk, NY, USA). Measurement data will be expressed as the mean ± SD. If measurement data obey a normal distribution, intergroup comparisons will be conducted using independent samples t-tests. If measurement data do not obey a normal distribution, intergroup comparisons will be conducted using rank-sum tests. A value of P < 0.05 will be considered statistically significant. We will collect and analyze the time, severity, and duration of adverse events and other unexpected responses, propose a processing scheme, and record measures and outcomes. Investigators will store all data in a secure, locked environment for future viewing. In accordance with Chinese Good Clinical Practice, all data will be kept for at least 5 years. The therapeutic principle in the treatment of moderate and severe cubital tunnel syndrome is to remove ulnar nerve compression and to recover blood supply and function. Elbow anatomy, the needs of patients, and the surgeon's skills are presently used to determine which surgical method will be used to treat moderate and severe cubital tunnel syndrome (Lund and Amadio, 2006; Yamamoto et al., 2006). The conclusions of outcomes for different surgical methods for treating moderate and severe cubital tunnel syndrome are inconsistent. Thus, this clinical trial aims to provide a reference for selecting an optimal method for the treatment of moderate and severe cubital tunnel syndrome. To date, Rui Li et al. have analyzed the difference in outcomes between operations for simple decompression and anterior transposition of the ulnar nerve in 12 elderly patients with cubital tunnel syndrome (nine men and three women, aged 60-70 years) in the Department of Hand Surgery, China-Japan Union Hospital of Jilin University of China from 1997 to 2004. There were seven farmers, one office worker, and three factory workers. Two patients had fractures and dislocations, and the remaining patients had affected elbow flexion and extension due to bending over a desk at work. The symptom onset was within 6 months of treatment in three cases and more than 6 months in ninecases. All patients experienced numbness, discomfort, and tingling in the area innervated by the ulnar nerve. The tingling was severe in some patients at night. The affected limb was not flexible during fine motor skill activities. The results of body examinations demonstrated sensory disturbance in the area that the ulnar nerve innervates, intrinsic muscle atrophy (including first dorsal interosseous), abnormal finger crossing, and claw hand deformity. These patients did not experience C 8 or T 1 intervertebral foramen stenosis, cervical spondylosis, orthoracic outlet syndrome. Patients having a medical history of symptoms within 6 months of treatment first received local physical therapy and block. If this treatment was ineffective, the following surgical procedures were performed. Anterior transposition of the ulnar nerve plus epineurium decompression was performed in seven cases. For this procedure, a curved incision was made in the medial elbow. The fascia and Osborne's ligament in the sulcus for ulnar nervewere incised to fully expose the ulnar nerve. The thickened epineurium was cut and removed. The adhesions along the epineurium were completely removed, and then sodium hyaluronate was used to prevent adhesions. An approximately 1.5 cm × 2.0 cm fascial flap was made in the area for anterior transposition. The smooth surface of the fascial flap that faced the ulnar nervewas then sutured facing outward. Thus, the ulnar nerve moved to the anterior cubital region could not slip backward during elbow flexion and extension. Plaster slab fixation at 90° was used for 2 weeks. Anterior transposition of the ulnar nerve plus perineurium decompression was used in five cases. For this procedure, part of the epineurium was excised during neurolysis, and the adhesions were removed. Sodium hyaluronate was used to prevent adhesions. The other procedures were performed identical to the descriptions above. The surgical outcomes were evaluated using the following rating scale: excellent, M 4 + S 3 + , no deformity, normal or basically normal function; good, M 3 S 3 , no or slight deformity, mainly normal function, a little inconvenience in work and daily living; average, M 2 S 2 , poor recovery of intrinsic muscles, protective sensation (prevents exposure to deep pressure or repetitive light pressure that can result in injury to the skin) and partial recovery of function, but some difficulty in daily life including work; poor, M 1 S 1 or below, severe deformity, loss of hand function. Thus, the best surgical method could not be determined so far due to the small number of cases investigated (Hou et al., 2006). QQL and RL conceived and designed the protocols, wrote the paper, and approved the final version of the paper for publication. Aicher B, Peil H, Peil B, Diener HC (2012) Pain measurement: Visual Analogue Scale (VAS) and Verbal Rating Scale (VRS) in clinical trials with OTC analgesics in headache. Cephalalgia 32:185-197. Akyuz M, Yalcin E, Selcuk B, Onder B, Ozçakar L (2011) Electromyography and ultrasonography in the diagnosis of a rare double-crush ulnar nerve injury. Arch Phys Med Rehabil 92:1914-1916. Bartels RH, Verhagen WI, van der Wilt GJ, Meulstee J, van Rossum LG, Grotenhuis JA (2005) Prospective randomized controlled study comparing simple decompression versus anterior subcutaneous transposition for idiopathic neuropathy of the ulnar nerve at the elbow: Part 1. Neurosurgery 56:522-530. Biggs M, Curtis JA (2006) Randomized, prospective study comparing ulnar neurolysis in situ with submuscular transposition. Neurosurgery 58:296-304. Bimmler D, Meyer VE (1996) Surgical treatment of the ulnar nerve entrapment neuropathy: submuscular anterior transposition or simple decompression of the ulnar nerve? Long-term results in 79 cases. Ann Chir Main Memb Super 15:148-157. Capo JT, Jacob G, Maurer RJ, Nourbakhsh A, Preston JS (2011) Subcutaneous anterior transposition versus decompression and medial epicondylectomy for the treatment of cubital tunnel syndrome. Orthopedics 34:e713-717. Catalano LW, Barron OA (2007) Anterior subcutaneous transposition of the ulnar nerve. Hand Clin 23:339-344. Davies MA, Vonau M, Blum PW, Kwok BC, Matheson JM, Stening WA (1991) Results of ulnar neuropathy at the elbow treated by decompression or anterior transposition. Aust N Z J Surg 61:929-934. Earle AS, Vlastou C (1980) Crossed fingers and other tests of ulnar nerve motor function. J Hand Surg Am 5:560-565. Fernandez EMD, Pallini RMD, Lauretti LMD, Scogna AMD, La Marca FMD (1998) Neurosurgery of the peripheral nervous system: cubital tunnel syndrome. Surg Neurol 50:83-85. Gervasio O, Gambardella G, Zaccone C, Branca D (2005) Simple decompression versus anterior submuscular transposition of the ulnar nerve in severe cubital tunnel syndrome: a prospective randomized study. Neurosurgery 56:108-117. Glowacki KA, Weiss AP (1997) Anterior intramuscular transposition of the ulnar nerve for cubital tunnel syndrome. J Shoulder Elbow Surg 6:89-96. Gu Y (2011) Current status and suggestion of clinical classification of carpal and cubital tunnel syndromes. Zhongguo Gu yu Guanjie Sunshang Zazhi 31:818-819. 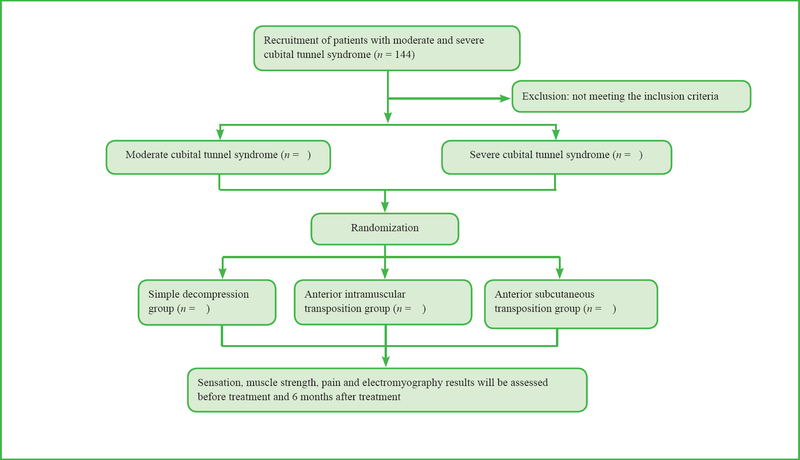 Hamidreza A, Saeid A, Mohammadreza D, Zohreh Z, Mehdi S (2011) Anterior subcutaneous transposition of ulnar nerve with fascial flap and complete excision of medial intermuscular septum in cubital tunnel syndrome: A prospective patient cohort. Clin Neurol Neurosurg 113:631-634. Henry M (2006) Modified intramuscular transposition of the ulnar nerve. J Hand Surg Am 31:1535-1542. Hou Y, Cui SS, Zhang WZ, Li R (2006) Comparison of the therapeutic effects of perineurium and epineurium neurolysis after anterior transposition of elbow ulnar nerve in the elderly. Zhongguo Laonian Xue Zazhi 26:478-479. Huang JH, Samadani U, Zager EL (2004) Ulnar nerve entrapment neuropathy at the elbow: simple decompression. Neurosurgery 55:1150-1153. Janjua RM, Fernandez J, Tender G, Kline DG (2008) Submuscular transposition of the ulnar nerve for the treatment of cubital tunnel syndrome. Neurosurgery 63:321-325. Kearns G, Wang S (2012) Medical diagnosis of cubital tunnel syndrome ameliorated with thrust manipulation of the elbow and carpals. J Man Manip Ther 20:90-95. Kilpadi DV, Cunningham MR (2011) Evaluation of closed incision management with negative pressure wound therapy (CIM): Hematoma/seroma and involvement of the lymphatic system. Wound Repair Regen 19:588-596. Kroonen LT (2012) Cubital tunnel syndrome. Orthop Clin North Am 43:475-486. Kuschner SH, Ebramzadeh E, Johnson D, Brien WW, Sherman R (1992) Tinel's sign and Phalen's test in carpal tunnel syndrome. Orthopedics 15:1297-1302. Li WJ, Tian GL, Chen SL, Zhu Y, Tian W, Wang SF, Yi CJ, Zhu J, Liu B (2008) Clinical analysis of subcutaneous anterior transposition of the ulnar nerve in 135 patients of cubital tunnel syndrome. Zhonghua Shouwaike Zazhi 24:326-328. Liao KR, Gao WY, Huang JW, Jiang ZC (1997) Cubital tunnel syndrome effect: a long term postoperative follow up in 48 cases of 45 patients. Zhonghua Shouwaike Zazhi 13:32-34. Lim JY, Lum CH, Tan AJ, Jackson T, Burrows S, Edgar DW, Wood FM (2014) Long term sensory function after minor partial thickness burn: a pilot study to determine if recovery is complete or incomplete. Burns 40:1538-1543. Liu CH, Wu SQ, Ke XB, Wang HL, Chen CX, Lai ZL, Zhuang ZY, Wu ZQ, Lin Q (2015) Subcutaneous versus submuscular anterior transposition of the ulnar nerve for cubital tunnel syndrome: a systematic review and meta-analysis of randomized controlled trials and observational studies. Medicine (Baltimore) 94:e1207. Lund AT, Amadio PC (2006) Treatment of cubital tunnel syndrome: perspectives for the therapist. J Hand Ther 19:170-179. Macadam SA, Gandhi R, Bezuhly M, Lefaivre KA (2008) Simple decompression versus anterior subcutaneous and submuscular transposition of the ulnar nerve for cubital tunnel syndrome: a meta-analysis. J Hand Surg Am 33:1314.e1311-1312. Mitsionis GI, Manoudis GN, Paschos NK, Korompilias AV, Beris AE (2010) Comparative study of surgical treatment of ulnar nerve compression at the elbow. J Shoulder Elbow Surg 19:513-519. Moberg E (1990) Two-point discrimination test. A valuable part of hand surgical rehabilitation, e.g. in tetraplegia. Scand J Rehabil Med 22:127-134. Murata K, Omokawa S, Shimizu T, Nakanishi Y, Kawamura K, Yajima H, Tanaka Y (2014) Risk factors for dislocation of the ulnar nerve after simple decompression for cubital tunnel syndrome. Hand Surg 19:13-18. Nabhan A, Ahlhelm F, Kelm J, Reith W, Schwerdtfeger K, Steudel WI (2005) Simple decompression or subcutaneous anterior transposition of the ulnar nerve for cubital tunnel syndrome. J Hand Surg Br 30:521-524. Ochi K, Horiuchi Y, Tanabe A, Waseda M, Kaneko Y, Koyanagi T (2012) Shoulder internal rotation elbow flexion test for diagnosing cubital tunnel syndrome. J Shoulder Elbow Surg 21:777-781. Ochi K, Horiuchi Y, Nakamura T, Sato K, Arino H, Koyanagi T (2013) Ulnar nerve strain at the elbow in patients with cubital tunnel syndrome: effect of simple decompression. J Hand Surg Eur Vol 38:474-480. Paternostro-Sluga T, Grim-Stieger M, Posch M, Schuhfried O, Vacariu G, Mittermaier C, Bittner C, Fialka-Moser V (2008) Reliability and validity of the Medical Research Council (MRC) scale and a modified scale for testing muscle strength in patients with radial palsy. J Rehabil Med 40:665-671. Stadie AT, Keiner D, Fischer G, Conrad J, Welschehold S, Oertel J (2010) Simple endoscopic decompression of cubital tunnel syndrome with the Agee system: anatomic study and first clinical results. Neurosurgery 66:325-331. Taha A, Galarza M, Zuccarello M, Taha J (2004) Outcomes of cubital tunnel surgery among patients with absent sensory nerve conduction. Neurosurgery 54:891-896. Wang LN, Gao XS (1996) Plastic Surgery. Beijing: People's Medical Publishing House. Wojewnik B, Bindra R (2009) Cubital tunnel syndrome - Review of current literature on causes, diagnosis and treatment. J Hand Microsurg 1:76-81. Yamamoto K, Shishido T, Masaoka T, Katori Y, Tanaka S (2006) Postoperative clinical results in cubital tunnel syndrome. Orthopedics 29:347-353. Zlowodzki M, Chan S, Bhandari M, Kalliainen L, Schubert W (2007) Anterior transposition compared with simple decompression for treatment of cubital tunnel syndrome. A meta-analysis of randomized, controlled trials. J Bone Joint Surg Am 89:2591-2598.